Around the Fort Calgary Historic Park in the downtown core of Calgary, Alberta there are many old fashioned pieces of equipment that tourists love to see. These wooden wheels belonged to a very viable part of the transportation system in the olden days and many miles have been put on these wheels. Fort Calgary Historic Park,Calgary, Alberta, Canada, North America. 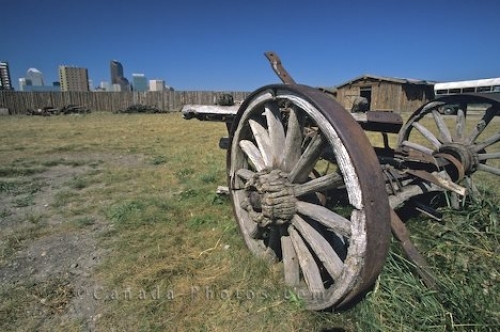 Picture of wooden wagon wheels displayed at the Fort Calgary Historic Park in downtown Calgary in Alberta, Canada.